Construction is RAMPING UP on the I-670 SmartLane project Monday night (March 18), quite literally. 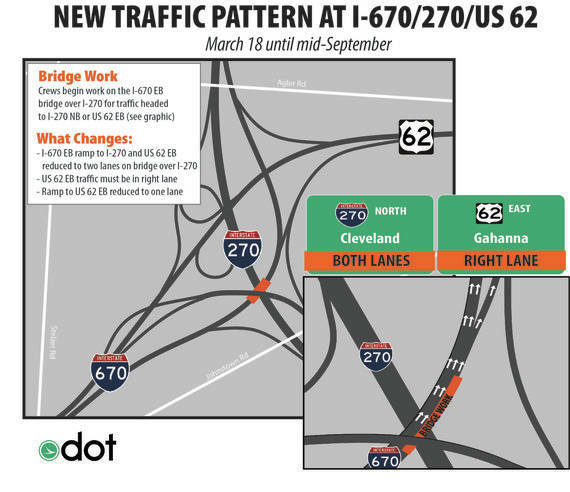 Crews begin work on the ramp from I-670 east to I-270 north and US 62 east, which means ramp traffic will be reduced to two lanes on the bridge over I-270 for six months. I-270 north traffic can use either lane, but drivers headed to US 62 east MUST be in the right lane (see graphic below). Instead of two lanes each for I-270 north and US 62 east, the exit to US 62 east will be one lane only beginning Monday. 7 PM: I-670 EB will be reduced to two lanes between Cassady Ave. and I-270 and the ramp from I-670 EB to I-270 NB will be reduced to one lane. 8 PM: The ramp from US 62 WB to I-270 NB will close. Detour: US 62 WB to I-270 SB to Hamilton Rd. to I-270 NB. 10 PM: The ramp from International Gateway/Stelzer Rd. to I-670 EB will close. Detour: International Gateway/Stelzer Rd. to I-670 WB to 5th Ave. to I-670 EB. 11 PM: I-670 EB will be reduced to one lane between Cassady Ave. and I-270. 12 AM: The ramps from I-670 EB to I-270 NB and US 62 EB will close. Detour: I-670 EB to I-270 SB to Hamilton Rd. to I-270 NB (to US 62 EB). 5 AM TUESDAY: All lanes and ramps open. Learn more about the project and see the final interchange configuration HERE. COLUMBUS, Ohio (AP) — Efforts to support Ohio’s vulnerable children and adults, prepare more skilled workers, and address water-quality concerns would get targeted funding increases under Republican Gov. Mike DeWine’s first state operating budget proposal , unveiled Friday. Officials said the plan for spending $69 billion in state revenue over two years wouldn’t raise taxes or affect the state’s rainy day fund, instead relying on anticipated slow, steady economic growth from existing revenue sources. DeWine said Ohio for too long has “tinkered at the margins” rather than investing in “transformational changes” and must take a longer view to benefit future generations. “Now is the time to tackle our unfinished business,” he said. He proposed nearly doubling state funding for family and children services to $151 million a year and giving schools $550 million over the biennium to support and encourage students through mental health counseling, mentoring, after-school programs and other efforts. He wants to require public universities to guarantee students the same tuition rate from their freshman through senior years. He’s also seeking to provide $30 million to help 20,000 Ohioans attain low-cost industry credentials, or “micro-degrees,” in growing fields. The budget would triple state funding for defending criminal suspects who can’t afford lawyers and allot $900 million now for water-quality projects over the next decade, including addressing toxic algae in Lake Erie. It also calls for raising the minimum age for buying cigarettes, other tobacco products and alternative nicotine products from 18 to 21. The proposal would preserve Medicaid expansion in Ohio but eliminate the Office of Health Transformation, which was created by DeWine’s predecessor, GOP Gov. John Kasich, to overhaul the Medicaid program and recommend reorganization of state health and human-service agencies. That office has completed its work, said Kim Murnieks, DeWine’s budget director. The budget covers the two-year period starting July 1. The GOP-led Legislature must debate changes and send it back for DeWine to approve before then. Democratic lawmakers said they were encouraged by the governor’s support for investing in children and families, cleaning up Lake Erie and maintaining access to affordable health care, but questioned how the proposed spending increase of more than $1 billion annually would be funded. “We can’t build a budget on broken economic assumptions or wishful thinking,” House Minority Leader Emilia Sykes, of Akron, said in a statement. Murnieks insisted the proposal was realistic and not based on padded estimates about revenue or expenditures. DeWine noted that his plan doesn’t count on any money from sports wagering, though a U.S. Supreme Court ruling opened that option for states, and lawmakers are considering a bill to legalize it in Ohio. The operating budget is separate from the transportation budget, in which DeWine sought an 18-cent gas-tax increase to fund needed road repairs and construction. The Ohio House approved a lesser increase of 10.7 cents per gallon . The Senate will consider it next. UPDATE: ODOT was able to open SR 257 today before beginning the next set of culvert replacements. This was done so that SR 257 can be used as a detour when US 42 closes in Union County this afternoon for investigation of yesterday’s plane crash. SR 257 will remain open today, but tomorrow morning it will close again between US 36 and US 42 to replace three culverts near Fry Road. The detour will be US 36 to Sectionline Rd. to US 42 or reverse. The culvert work is expected to be complete Friday, March 22. COLUMBUS, Ohio (AP) — The state school board is recommending that Ohio lawmakers give high school students more flexibility to earn a diploma through options not relying on standardized tests. The latest recommendation would give students more ways to prove their skills in five categories, including math, English, and leadership and social development. The state previously provided flexibility for the classes of 2019 and 2020 after educators warned that too many students were at risk of not meeting increased test score requirements to graduate on time. Critics say the point of raising those requirements was ensuring graduates are prepared for college or the workforce and that creating alternative paths to graduation is a disservice to students. The conversation about graduation requirements is expected to continue as state lawmakers consider what to do. COLUMBUS —Nearly 275 school board members, administrators, staff, students and guests from across central Ohio gathered in Columbus on March 13for the Ohio School Boards Association (OSBA) Central Region Spring Conference. The region hosts two conferences a year, one in the spring and one in the fall. The conference featured updates from OSBA officers and staff and a number of awards. The region recognized outstanding schools and school programs; veteran school board members; outstanding board members; and board members achieving service milestones of 10, 15 and 20 years. Fourteen counties comprise the OSBA Central Region: Crawford, Delaware, Fairfield, Fayette, Franklin, Knox, Licking, Madison,Marion, Morrow, Pickaway, Richland, Ross and Union. The other OSBA regions are Northeast, Northwest, Southeast and Southwest.In its 64thyear, the Ohio School Boards Association leads the way to educational excellence by serving Ohio’s public school board members and the diverse districts they represent through superior service, unwavering advocacyand creative solutions. COLUMBUS – Major Marla K. Gaskill was promoted to the rank of lieutenant colonel today by Ohio Department of Public Safety Director Thomas J. Stickrath during a ceremony at the Patrol’s Training Academy. Lieutenant Colonel Gaskill will transfer from her current assignment in the Office of Planning and Finance to serve as a lieutenant colonel in the Office of the Superintendent. Lieutenant Colonel Gaskill is the first woman to hold this position in Patrol history. Lieutenant Colonel Gaskill began her Patrol career in May 1989 as a cadet dispatcher assigned to the New Philadelphia Post. She began her training as a member of the 119th Academy Class in January 1990. She earned her commission in June of that year and was assigned to the Wooster Post. As a trooper, she also served as a pilot in the Aviation Unit. In 1997, she was promoted to the rank of sergeant and transferred to the Norwalk Post to serve as an assistant post commander. As a sergeant, she also served at the Delaware Post and in the Administrative Investigations Unit. In 2001, she was promoted to the rank of lieutenant and transferred to the Marysville Post to serve as post commander. In 2006, she was promoted to the rank of staff lieutenant and transferred to the Office of Human Resources. As a staff lieutenant, she also served in the Office of Personnel, Office of Field Operations and Capital Operations. In 2011, she was promoted to the rank of captain and transferred to the Fiscal Services Section. In 2016, she was promoted to major and transferred to the Office of Planning and Finance. Lieutenant Colonel Gaskill earned a Bachelor of Arts degree in political science from Capital University in 2001. In 2005, she completed a leadership executive training course at the Southern Police Institute. She also earned a Master of Business Administration degree in applied leadership from Franklin University in 2008. COLUMBUS – Lieutenant Colonel Richard S. Fambro was ceremonially promoted to the Ohio State Highway Patrol’s highest rank today by Ohio Department of Public Safety Director Thomas J. Stickrath. Colonel Fambro will serve as the 19th Superintendent of the Patrol, making history as he becomes the first African American to hold this position. He succeeds former Superintendent, Colonel Paul A. Pride, who led the Patrol since August 2013. Colonel Richard S. Fambro, a 29-year veteran, joined the Patrol in August 1989 as a cadet dispatcher assigned to the Lancaster Post. He became a member of the 119th Academy Class in January 1990. He received his commission in June of that year and was assigned to the Dayton Post. In 1994, he was selected as Post Trooper of the Year. In 1997, he was promoted to the rank of sergeant and transferred to the Springfield Post to serve as an assistant post commander. In 2000, he was promoted to the rank of lieutenant and transferred to the Lancaster Post to serve as post commander. In 2003, he was selected to serve as the Patrol’s spokesperson in the Public Affairs Unit. In 2004, he was promoted to the rank of staff lieutenant and transferred to the Office of Logistics and Security Services. As a staff lieutenant, he also served at the Columbus District Headquarters as an assistant district commander. In 2010, he was promoted to the rank of captain and transferred to the Office of Investigative Services. As a captain, he also served in the Office of Special Operations and in the Office of Criminal Investigations. In 2014, he was promoted to the rank of major and transferred to the Office of Planning and Finance. As a major, he also served in the Office of Personnel. In 2018, he was promoted to the second-highest rank of lieutenant colonel and served as an assistant superintendent. Colonel Fambro completed advance leadership training at Northwestern University’s School of Police Staff and Command and attended the U.S. Army War College. He earned a Bachelor of Science degree in business administration from Ohio Dominican University in 2004, and he will complete his studies to obtain a Master of Science in Management degree from Mount Vernon Nazarene University in May of 2019. The Ohio State Highway Patrol is an internationally accredited agency whose mission is to protect life and property, promote traffic safety and provide professional public safety services with respect, compassion, and unbiased professionalism. COLUMBUS, Ohio (AP) — A senior federal judge from Cincinnati will handle the mediation of two lawsuits filed against Ohio State by scores of men alleging the university ignored or failed to stop decades of sexual misconduct by a now-deceased team doctor. After lawyers for OSU and the men couldn’t agree on a mediator, the suits were referred Friday to U.S. District Judge Michael R. Barrett by Judge Michael Watson in Columbus, who has overseen the cases. Lawyers on both sides mostly shared little reaction Friday, saying simply that they look forward to working through mediation with Barrett. One attorney for some of the plaintiffs, Jack Landskroner, said the decision provides “a strong and credible mediator” for the matter. Barrett has been federal judge in the Southern District of Ohio since 2006. He previously worked as a litigator, an assistant county prosecutor and an administrative hearing officer for the state, and he has served on the University of Cincinnati board of trustees. Watson’s order described Barrett as “exceptionally well-suited to resolve these cases” but didn’t elaborate further. The plaintiffs’ suggested mediators had included people used in cases involving Michigan State and Penn State, but Ohio State said it wouldn’t agree to those because the handling of those cases led to controversy. OSU had recommended a former federal judge or a federal appeals court mediator. No one has publicly defended the doctor , Richard Strauss, who killed himself in 2005. His family has said only that they were shocked at the allegations, which span 1979 to 1997 and include athletes from at least 16 sports, as well as his work at the student health center and his off-campus clinic . More than 150 former students have provided firsthand accounts of alleged sexual misconduct by Strauss. Many of those speaking publicly say they were unnecessarily groped during exams. A law firm is investigating the allegations for Ohio State. Some Strauss accusers have questioned the independence of that investigation, but the school has insisted it’s committed to uncovering the truth. The claims have spurred an investigation by the U.S. Department of Education Office for Civil Rights. COLUMBUS—State Reps. Adam Miller (D-Columbus) and Kyle Koehler (R-Springfield) today (March 13) announced bipartisan legislation that would strengthen penalties for soliciting prostitution and increase funding for Ohio’s Victims of Human Trafficking Fund. Ohio’s ongoing opioid crisis has led to an increase in prostitution across the state. Over the past two years, the number of prostitution-related arrests have increased by more than 30 percent, according to police statistics. More than two-thirds of women involved in human trafficking who were addicted to opioids became prostitutes after their opioid use began, according to the Polaris Project. In Franklin County, a first-time offense of soliciting is a third-degree misdemeanor, with a maximum sentence of 60 days in jail and a fine of up to $500. However, most offenders plea down to a small fine, typically around $150. The proposed legislation would take solicitation offenses from a third to a first-degree misdemeanor, increasing fines for solicitation to up to $1,500, nearly half of which could go to court-sanctioned prostitution prevention or victim relief programs. In addition, the bill would make solicitation within 1,500 feet of a school or place of worship a fifth-degree felony, punishable by a fine of up to $1,500, with up to $750 going to prevention and relief programs. COLUMBUS, OH – During the fourth quarter of 2018, Ohio’s horizontal shale wells produced 5,810,484 barrels of oil and 663,534,323 Mcf (663 billion cubic feet) of natural gas, according to figures released today by the Ohio Department of Natural Resources (ODNR). Natural gas production from the fourth quarter of 2018 showed a 31.89 percent increase over the fourth quarter of 2017, while oil production increased 38.56 percent for the same period. The average amount of natural gas produced was 296,088 Mcf. The average number of fourth quarter days in production was 86. Ohio law does not require the separate reporting of Natural Gas Liquids (NGLs) or condensate. Oil and gas reporting totals list on the report include NGLs and condensate.